Whether or not drum machines have soul, you can bet the LinnStrument does. The creation of Roger Linn couples a grid layout – one that keeps pitch relations consistent for easy playing – with expressive touch sensing. Until now, you could get a US$1499 version with 200 pads. A new version drops the price to $999, and uses a 16 * 8 = 128-pad layout, so it’s both cheaper and more portable. And all the LinnStruments now get step sequencing. But let’s back up. There are two things that make the LinnStrument unique. One is its onboard expressive touch control. It senses continuous pressure and slides/bends, and it’s able to transmit those via MPE (MIDI’s new standard Multidimensional Polyphonic Expression). That puts it in a league with the ROLI Seaboard line and the Madrona Soundplane, among a handful of others, and means out-of-the-box expression support in the likes of Apple Logic and Bitwig Studio. With supported instruments like Apple’s Sculpture, you’ll find that nuances of your finger pressure, or sliding multiple notes up and down at once, are instantly translated into sound. I’m a big fan of the ROLI’s piano-style layout. I think it’s best to think of these as two different animals – just ones that send the same flavor of MIDI messages (if desired). A piano layout is always going to be comfortable for piano players – and the tactile sensation of the ROLI, while an aquired taste, is like nothing else. The LinnStrument is closer in lineage to a fretboard than a piano, for its part, and a step sequencer only makes sense with a grid. To me, the new 128-pad layout is really a win – not just because it gets it at a more accessible price point or because the device becomes more portable, but because it’s a logical layout for a lot of people, too. 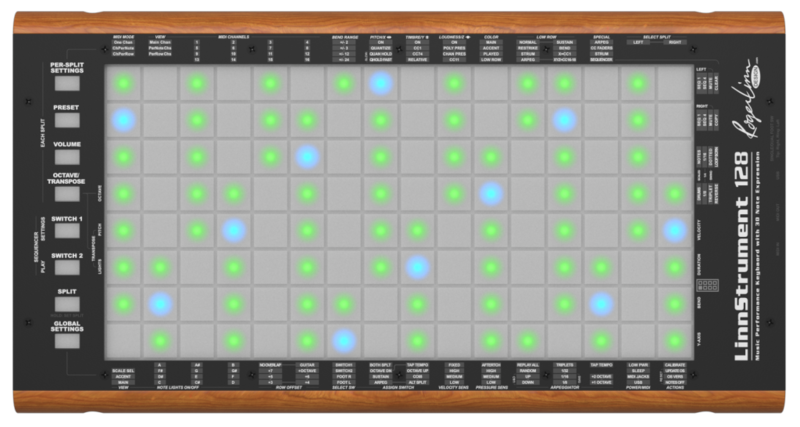 And Roger knows a little something about grids: his drum machine designs have been the ones that popularized the touch-sensing pad and 2×8 and 4×4 layouts. 2-track step sequencer with per-note velocity/duration/bend/y-axis values, any time signature, independent track step sizes and loop lengths, scales/drums/notes views, reverse play, live play while sequence plays, swing timing and more. That last bit is important. Maybe better than imagining two tracks is imagining two surfaces at once. You could have two sequencers running. Or you could have one sequencer running and then play live over top. Whichever size you opt for, the LinnStrument still supports 32 steps – 2 pages of 16 on the bigger model, or 4 x 8 on the new LS128. You can load up patterns, too. Each project holds four patterns for each of the two sequencers. And you can store up to 16 projects on the device. And you can load / backup / offload projects using your computer via the updater app. Sync is flexible, too: the LinnStrument both sync to MIDI clock and generates a MIDI clock signal. And you can adjust tempo live as you play. New Polyphonic 2-Track Step Sequencer! 4 new LED colors: white, orange, lime and pink. 14-bit pressure resolution using LSB/MSB Control Change pairs. The MIDI OUT jack can now also act as a combined MIDI OUT and MIDI THRU. Panel and Foot Switches can now be assigned to Tap Tempo. Showing just how much you can play, you get instruments from Sample Modeling, Apple Logic Pro X, Impact Soundworks, Applied Acoustic Systems and Orange Tree Samples.